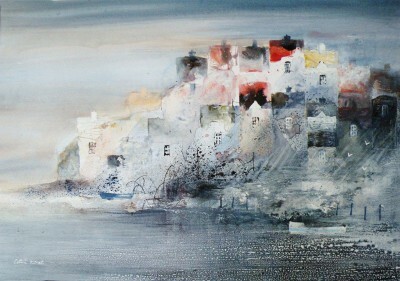 Right now we are waiting for new Colin KENT Seascape Art to arrive at the gallery. In the meantime, here is a wider selection of the artist's work featured at the Red Rag British Gallery. Colin Kent was born in London in 1934. From a young age he always wanted to be an artist and studied painting and architecture at Walthamstow College of Art. He was encouraged to be a painter whilst at college by the other students and also teachers, but worked for a number of years as an architect. 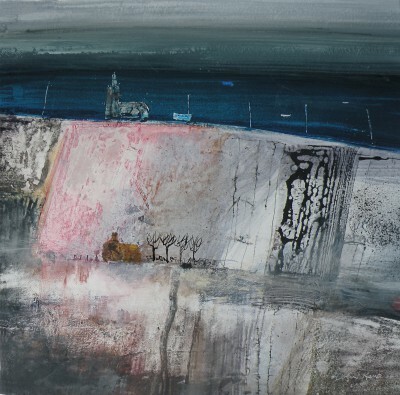 Colin Kent produces paintings with a real feel of a time and a place. His art works display great sense of atmosphere and are often stark and haunting. His very distinctive style of British art creates a feeling of isolation without loneliness or melancholy. There is a deceptive simplicity in Colin's paintings and his skill is in getting the viewer to realise how the ordinary can become dramatic and extraordinary. Colin Kent produces paintings of great quality. He is a master in combining the use of ink and gouache in conjunction with watercolour to achieve the texture and delicate tonal values for which he is known. The sea and coastal locations have been a constant inspiration for Colin Kent. 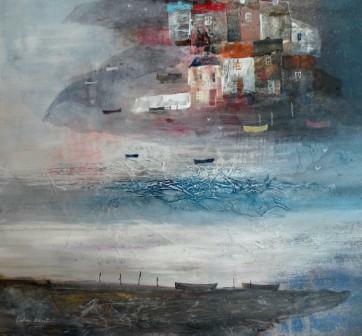 In particular he loves the coastal and inland locations of East Anglia. However historically his art work is much more about capturing the atmosphere of a place and finding locations where solitude predominates and natural forms have softened the evidence of man. In recent years Colin Kent he has broadened his subject matter. His paintings sometimes feature church interiors and flowers. Whatever the subject his paintings display a fine use of ink, gouache, acrylic and watercolour. And, he successfully uses colour to add a dramatic quality to the paintings with an almost abstract approach to composition. Each painting at Red Rag is sourced from the Colin Kent artist studio and like all Red Rag British art and Contemporary art it can be shipped worldwide.